Packed game tables featured Element, This Belongs in a Museum, We Come in Peace and more from Rather Dashing Games. Element designer Mike Richie demos the game at Origins Game Fair. Element was a hit, rising as high as No. 4 on the BGG Geekbuzz list during the show and ended the show sitting at No. 10. Element sold out, but don’t worry if you didn’t get a copy! More copies are available on our website and through your local FLGS. We’ll also be releasing more “how to” videos on Element very soon so check back on our website. This Belongs in a Museum, our new tile-laying game released in April, was so popular it sold out TWICE! After selling out Friday, we went on a midnight run for more games to be ready for sales Saturday. And that was a good thing — we sold out again! Team Rather Dashing Games had so much fun introducing everyone to our games. Look for this crew again at Gen Con in Booth 1439. We had a chance to play our September release, Hafid’s Grand Bazaar, at the Hyatt Saturday night. 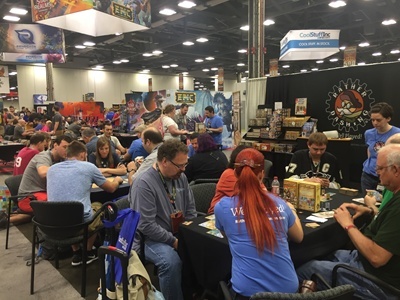 If you missed the sneak peek of this fast-paced game of bidding and haggling, come see us at Gen Con! Rather Dashing art director Grant Wilson leads a game of our first release planned for 2018. Check back on our website for more info in the coming weeks! We love the visitors to our booth! This one was just too dashing — we had to snap a pic! Thanks for all the fun, Origins! The presence of mummies in This Belongs in a Museum adds yet another strategic layer to this tile-laying game of area control and board manipulation. Mummies begin the game on the Tomb Tile. The Tomb Tile is the foundation tile for building the game board as you play. The movement and placement of mummies throughout the game provide you with opportunities to thwart the movements and actions of other players. A mummy’s location at the end of the game can gain or lose points for you and the other players, depending on their placement. Mummies can be moved off the Tomb Tile when an Action Tile is placed in play in lieu of taking the action allowed by the icon on the tile. Mummies can be moved to any unoccupied space on the active game board, except base camps. Players can move any color mummy, not just their own color. TIP: Use another player’s color mummy to block movements and your color mummy to steal points. When moving an archeologist, players cannot move through sections that are occupied by a mummy. This applies to the entire connected section of the same color, and not just the single temple space on which the mummy sits. Mummy influence does not extend past mountains, rivers, or airports. In the image below, an archeologist could NOT move through section A, but could move through section B, even though the two sections are connected via the mountain tile. To get to the other side of a mummy-occupied section, archeologists will need to spend movements to go around or use an airport. TIP: Placing a mummy in the path of an opponent’s archeologist can force them to take multiple turns worth of movements to collect a single artifact or spend an action tile or airport tile prematurely to get around a mummy. At the end of the game, any section occupied by a mummy claims the points for that section for the archeologist of the same color as the mummy. In the image below, the entire connected green section that would equate 6 points would be taken away from the green archeologist and given to the blue archeologist because the blue mummy is inside that section. Note: you get the points for the entire section, not just the single temple space. Mummy influence for stealing points is limited by rivers and mountains. TIP: Holding on to an action tile until the last turn can give you the opportunity to remove a mummy from one of your scoring sections and move it into another player’s section. Or, you may choose to move your color mummy into another player’s highest scoring section to steal their points for yourself. Did these tips help you develop some new strategies? We hope you are eager to get back to the table and try new combinations. This Belongs in a Museum is available now at a Friendly Local Game Store near you and online through our web store! In This Belongs in a Museum your main objective is to create the largest network of connected dig sites by placing your color tiles strategically to maximize points. There are multiple ways to make those connections and we’re going to show you those today. Multiple tiles of the same color laid next to each other with at least one quarter touching the same color are considered connected. You can create large or small sections of connected tiles by placing the tiles next to each other or using the action icons to rotate, swap, or replace tiles so that your colors are touching. Some of the tiles have terrain segments representing rivers and mountains. Separate sections of the same color that can be traced back to each other through rivers and mountains are considered connected to each other and count as part of your network. In the image below, the green sections are connected by a mountain and the blue sections are connected by a river. Placing tiles to create smaller sections that are connected via rivers and mountains (or using the action tiles to rotate, swap, or replace tiles to create those connections) helps protect you from the point-stealing mummies at the end of the game. There are six airport tiles in the game that allow you to move your archeologist around the board more quickly by jumping from airport to airport as a single space movement. Airports connect to each other, so any tiles connected to an airport are considered connected to networks that have a connection to another airport in a different location in play. Your base camp tile also acts as an airport, so any tiles connected to another airport are considered connected back to your base camp. Lastly, if you have a section that is not connected back to your base camp by any rivers, mountains, or airports, it is still considered connected if your archeologist is in that section at the end of the game. This is a way to utilize your movements once you have collected all your artifacts to connect a stranded section back to your network. 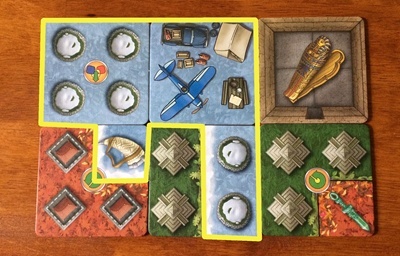 Each archeologist has their color represented on two tiles featuring artifacts, if an artifact space with your color background is connected to your network, you receive three (3) points for that space instead of the one (1) point you receive for each of the temple spaces. With the myriad of ways to make connections, this game truly never plays the same way twice and you have many strategies at your disposal to maximize your score. See more about This Belongs in a Museum on the official game page, including a How to Play video and testimonials. Great news! 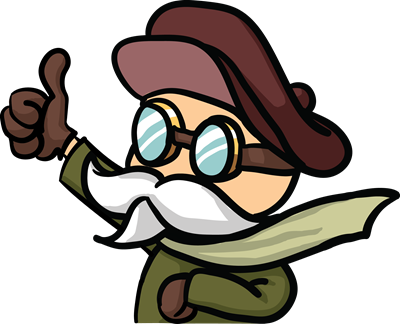 Rather Dashing Games will soon be available in two new countries. We’ve recently received orders from Vengeful Games in Denmark and Pixel Park in New Zealand. If you’ve been wanting to get your hands on our games in these countries, check in with your local game stores to see if they’re in yet! If not, be sure to ask them to stock our games. We’ve been thrilled about the overseas demand for our games, especially our award-winning abstract strategy game Element, so we are so pleased it, and our other fine games, will be available soon in Denmark and New Zealand. We’re working on more distribution channels as well, so stay tuned. In the U.S. and Canada, Rather Dashing Games are available through ACD, GTS, Southern Hobby, Peachstate, Aladdin and Universal. New distributors and retailers interested in ordering from us can email us at sales@ratherdashinggames.com.